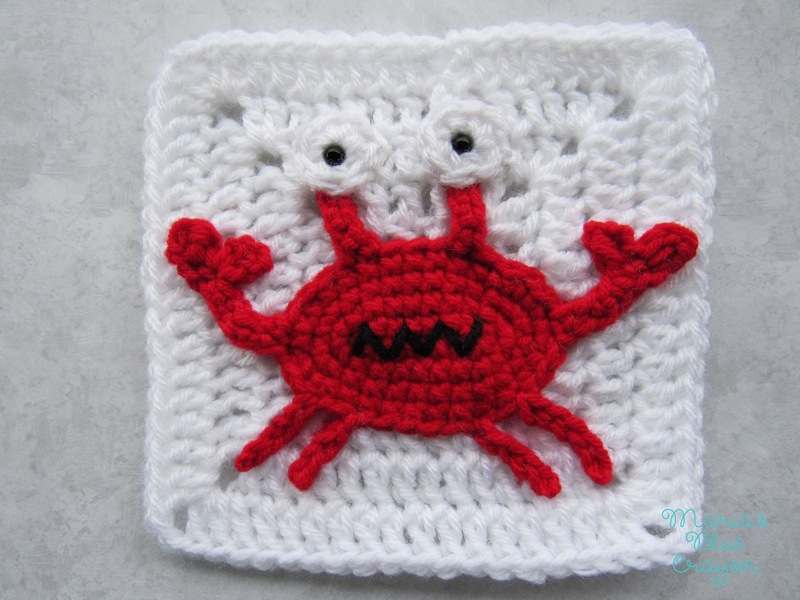 GET THE CROCHET CRAB APPLIQUE ALONG WITH THE GRANNY SQUARE PATTERN IN AN AD-FREE PDF DOWNLOAD HERE. OR SCROLL DOWN FOR THE FREE CROCHET CRAB PATTERN. 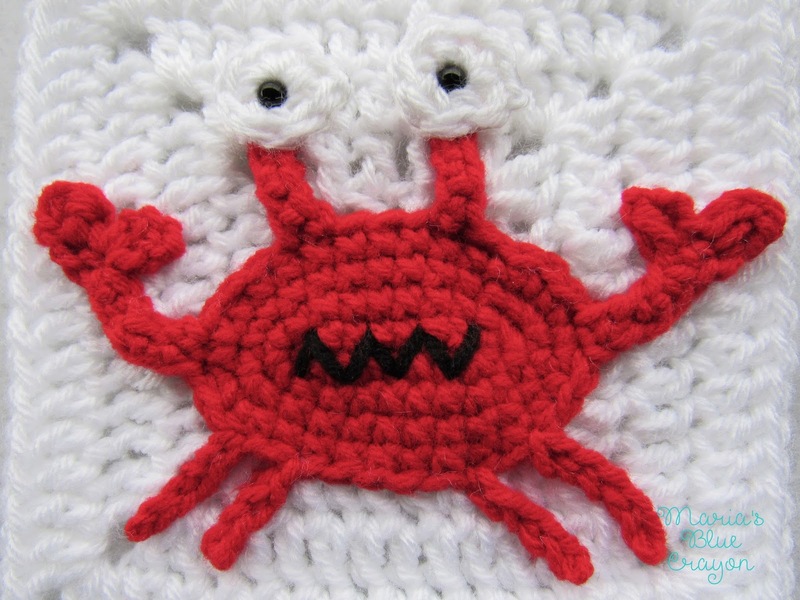 Isn’t this crabby crab the cutest?! This is officially the start off to my Ocean Themed Granny Square Afghan Series! I have lots of ideas and I can’t wait to get them out of my head and into crochet form! I’m already quickly working up the granny squares for this afghan. Last week was a hot one for us here in Central PA (high 80s), so it was nice to have some small squares to work on outside while my son played with his water toys! I already have about half of the squares done, but a lot more designing to do! To be honest, I haven’t quite figured out how many of these ocean critters I will design. I’m going with the flow on this one and I can’t wait to see where it takes me! To find the granny square pattern along with the afghan layout, yarn colors and amounts needed, and a running list of creatures designed for this project – CLICK HERE! *Those safety eyes are the cheapest around. You can purchase them at a craft store, but I’ve seen them for about $3 for only 10 pieces. For about $6, you can get 100! Perfect for amigurumi and for my Woodland Afghan Series. If you are having trouble starting the foundation single crochets on the body of the crab, I did the same technique with my moose applique for his antlers – I included pictures that you can check out here. You should still be on the main body with yarn intact. Slip stitch in next stitch. Insert your hook into the next space, yarn over, pull through the stitch, yarn over, pull through one loop, yarn over, pull through two loops. This completes one foundation single crochet. Foundation single crochet 4 more times and fasten off. For the second eye stalk, attach yarn 3 spaces to the left of the first one. Chain 1, insert hook into next stitch, yarn over, pull through the stitch, yarn over, pull through one loop, yarn over, pull through two loops. This completes one foundation single crochet. Foundation single crochet 4 more times and fasten off. Magic Ring, chain 1, 8 HDC into ring, join to first HDC, fasten off. Place safety eye in the middle. – do not attach the backing yet. Attach the eye with the safety eye into the last foundation SC of the eye stalk. Attach backing of safety eye. Count 6 to the right of the right eye. Attach yarn, Chain 1, insert hook into next stitch, yarn over, pull through the stitch, yarn over, pull through one loop, yarn over, pull through two loops. This completes one foundation single crochet. Foundation single crochet 5 more times. Count 4 to the left of the left eye. Attach yarn, Chain 1, insert hook into next stitch, yarn over, pull through the stitch, yarn over, pull through one loop, yarn over, pull through two loops. This completes one foundation single crochet. Attach yarn 3 spaces to the left of the left claw. Chain 6, fasten off. Attach yarn 2 spaces left of last leg. Chain 6, fasten off. Attach yarn 3 spaces to the right of the right claw. Chain 6, fasten off. Attach yarn 2 spaces to the right of last leg. Chain 6, fasten off. Sew mouth with tapestry needle and black yarn in a zig zag pattern. Sorry you are having trouble with the pattern. I'm not sure how to further explain row 1. Start with chaining 8, make a single crochet in the second chain from the hook and single crochet in the next 5 Chain spaces. There will be one chain space left where you will make 3 single crochets all into that last stitch. Once that is complete you will be working on the other side of the chain so you will need to turn your work 180 degrees to work on the other side of the chain. Then you will work single crochets in the next 5 stitches and in the last space work 3 single crochets all in last space before joining. It will make an oval. I'm not sure how else to write the pattern. I hope that explanation is helpful.